Smallmouth Bass are not a dominant species in Lac Seul. Their numbers have been growing fast over the years and are now becoming a viable fishery. The reason for this is because there are such vast amounts of prime Smallmouth habitat on Lec Seul and the bass can pick and choose where they want to be based on food supply. If they are migrating from shoal to shoal or island to island in hunting packs looking for food, they may clean out an area and then move onto the next. Lac Seul is dotted with thousands of islands and shoals and hitting each one is using a lot of gas and time. 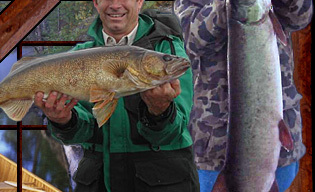 The best place to start looking for Smallmouth is in areas where you think the population of Muskie and Pike is limited. Pike like weedy bays and points leading into weedy bays. Muskie like to stay along the weed lines on the outside of bays that face the open lake. The best place to fish Smallmouth is around Islands and shoals that don't have thick weeds between the island and the shoreline. You can also hit the shoals and islands out in the open lake. Still Days: On still days when the water surface is like glass, the Bass are feeding but they tend to explore their area and get spread out alone the shore. Sometimes baitfish will feel too vulnerable and head deeper into darker water and the Bass will follow them. If you are not hitting fish at rocky points or over rocky shoals, try covering some area and troll along the shore about 15 yards out and cast towards shore with small black Mepps Furies or Blue Rapalas or Blue Thundersticks. If the bass have gone deeper, try sinking blue, black or worm-colored tub jigs off in the deeper water that is just off the shoal or rocky point. 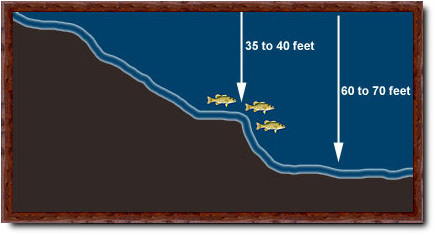 If it's late summer or fall, the Smallmouth Bass may go as deep as 40 feet. In this case, you may want to use your depth finder and find shelves and ridges down at the 30 to 40-foot depth. Bass will hang around drop-offs and ridges so they can quickly change depth in case of large fluctuations of atmospheric pressure. Baitfish seem to congregate along ridges after coming out of open water. It's the closest to protective structure that they can find. If the wind dies down, take off the jigs and put a big fat worm on a hook with no weight and just let the worm slowly sink. Windy Days: When it's windy and sunny, that is the very best time for Smallmouth Bass. Normal behavior is to patrol around and on top of the shoals. When it's windy, the big Bass will move to the backside of the shoal on the opposite side of where the waves are hitting the rocks. This is also true for points. 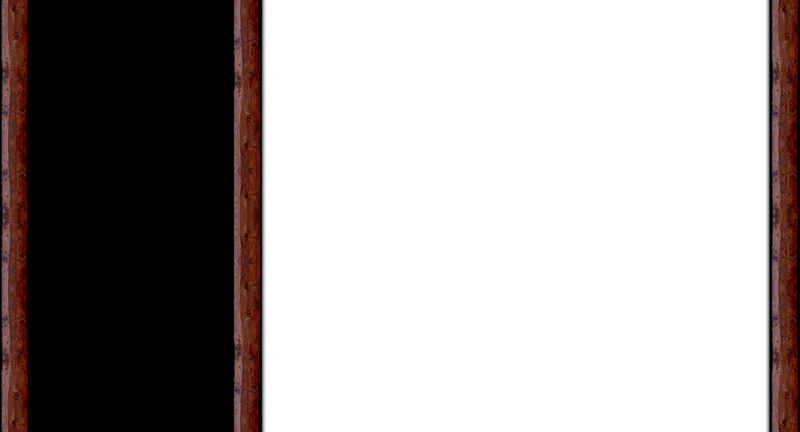 The bass will move to the backside of the point. They may come up shallow or site back in 5 to 10 feet of water. You can cast with lures because they will keep their eye on the shallow water and come up and hit lures just under the surface. You can also try some lures that go deeper. The very best way to get the big Smallmouth is to get a good size bass hook and put on a big worm with no weight and cast out and let the worm slowly sink. What you can do is un-clip your bail and let the bass take the worm and run with it for 10 second before setting the hook. You can also use the same technique with a live minnow, if you are on a lake that allows live bait. Some of the biggest bass are taken this way. When it's windy, Smallmouth Bass will also head towards a rocky shoreline. Depending on how big the waves are, the bass will sit off in 5 to 10 feet of water but stay close to where the waves are pounding the shoreline. Big waves bring in warm surface water and surface food, which attracts minnows. The big waves also cause an oscillation in the water that the bass do not like. They site off-shore in quiet water but close enough to the turbulence to see unsuspecting prey. Rain and low pressure: Generally the Bass will go deep and stop feeding when it's raining or if a low-pressure system moves into the area. They don't always stop feeding. In this case, try heavy tub jigs and fish a lot deeper. On small inland lakes, the bass will go 15 to 20 feet deep. On big lakes, people have found incredible success fishing 30 to 40 feet deep using tube jigs. Sunny and Hot: In some lakes, the bass will hide in thick weeds. This is a good time to try weedless rubber baits like a Texas Rig or a Carolina Rig. These rigs are usually used for Largemouth Bass but can be effective for thick-cover Smallmouth Bass. In a lake like Lac Seul where there is a high population of giant Muskie and Pike, the Bass may not feed while in the weeds. Small bass in the 1/2 to 2-pound range will school and stay in hunting packs. Generally the really big Smallmouth Bass that are 3 pounds and bigger will travel in mating pairs. They will also have a territory and try to keep the smaller bass out. If you find a spot that looks really good for Bass and you are not catching any, most likely there is a pair of really big bass in the area. They are big because they are smart. Be very quiet and try casting with lures or jigs. If you don't get anything, leave the area for an hour and then come back quietly and try using some slow baits that will not spook them. A big worm on a hook with no weight is the very best. If you still don't get anything, it may means a big Muskie or pike is in the area. That's when you put on some bigger lures and try to catch Muskie or Pike. 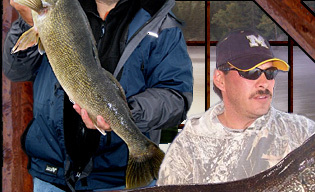 If not interested in Muskie or Pike, then move on to the next spot. There are thousands of islands and shoals to fish on Lac Seul.